What’s the Best Hiking Boot Bag? Have you ever needed to fly away on a short weekend trip and wanted to get some hiking in while you were away? However, you only have a carry on or two in your baggage allowance. I am not sure if you’ve ever tried to do this, but trying to squeeze hiking boots into a plastic bag and then a carry-on bag, on top of your hiking gear and clothes, is not an easy thing to do. Especially if your boots are wet! Similarly, after a typical day hiking in the mountains, have you ever needed a handy way to pack your boots away without putting them on the floor into your own or someone else's car? I often need to get a ride back to a meeting spot where me and my hiking friends met before carpooling to get to our hiking start point. It can be easy to forget to pack a plastic bag or something else to put your boots in when you’re finished. These are just a couple of examples of where a hiking boot bag can be a really useful thing to have. So, let’s start with the basics. What is a Hiking Boot Bag? A hiking boot bag, is exactly what it says on the tin. It’s a bag to put your hiking boots in. It is used for the purpose of carrying your hiking boots while in transit on your way to and from your hike. It enables you to pack your hiking boots neatly away so you can carry them in a tidy and efficient manner. 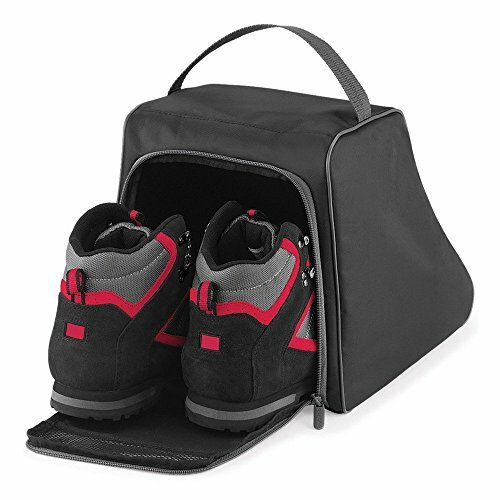 A boot bag also provides an extra bit of protection for your boots should they get knocked about in the trunk of a car, or in a baggage hold. By design hiking boots are big and chunky so they’re just not that amenable to tight spaces like carry on bags. So when travelling, typically they wind up in a plastic bag for journeys from A to B. This isn’t ideal, especially after using them, as moisture can’t get out so they can get smelly and muggy after a period of time and that definitely isn't good to have in and around your clothes in a carry on bag!. What to do … A hiking Boot Bag is the answer! The Quadra Hiking Boot Bag is a one size fits all bag. It features a handy carry handle and utilizes an easy access zip, as well featuring functional ventilation windows to let wet and dirty boots breathe. What to Look for in a Hiking Boot Bag? If I had to sum up in two words what a hiking boots bag should do, for me, it would be practicality and functionality. I want a hiking boot bag that is first and foremost practical but it needs to be functional and able to do what it is designed to do.So what does practicality and functionalityinvolve? Next up, is should be well constructed with a suitable material. You need a durable material but also ideally one with some level of breathability. Starting with durability, you are putting hard and heavy boots into your hiking boot bag, possibly with dirt and so on, on them so the boot bag needs to be able to take a bit of abuse. Durability also plays an important role in terms of the carry handle. You need a good strong carry handle that is comfortable in your hand and easy to use. With all that in mind, a tough durable synthetic construction using polyester is ideal. Synthetic materials like Polyester also lend themselves well to cleaning. After putting dirty boots into your boot bag for a few weeks or months on the trot, your boot bag will need a bit of a clean itself, and synthetic materials are good for that. Next up, breathability. Hiking boots tend to get wet and damp, so they need to be able to breathe if they’re sitting in a bag for any length of time. Again, a suitable synthetic material used in the construction will significantly help with this. Otherwise, some kind of venting capability built into the bag is a must in my opinion. The final thing to think about is size. The different types of hikin﻿﻿g boots available are as varied as anything else these days. There are all sorts of types and styles which are used for different purposes. You may need to take this into consideration when getting a boot bag. I think if you’re getting a relatively standard sized pair of hiking boots like the Lowa Renegade GTX, this shouldn’t be a big issue or consideration for you, unless you wear very large or wide sizes. Where it might come more into play for even standard sized hiking boots, is when you have tougher and bigger boots. For example, the Salomon 4D 2 GTX are going to be a bit chunkier than the aforementioned Lowa Renegade GTX as they’re more or a backpacking boot as opposed to a light hiker. If you need to pack serious winter Alping style boots, it becomes even more of a consideration. It’s easy to work it out though, just check out the measurements of the hiking boot bag and make an approximation in relation to the actual size of your hiking boots. In conclusion, a hiking boot bag is a simple but really cool little thing to have available when you head out on your hiking adventures. Just think, no more plastic bags or dirty boots lying in your car, or someone else's for that matter 🙂 As well as that, it is an easy way to transport your hiking boots while on the move, especially on planes and trains ... as well as automobiles. Definitely a good investment if you need a simple solution! What do you think, is a hiking boot bag a good investment? Ahnu Sugarpine Hiking Boot’s For Women Review Leather vs. Synthetic Hiking Boots, Which is Better? Lowa Women’s Renegade GTX Mid Hiking Boot Review How To Select A Sleeping Bag The Dry Bag – A Perfect Piece of Kit to Keep Your Stuff Dry While Hiking! Many thanks for the tips – I will definitely be investing in one soon! Great Linzi, they’re handy for sure.